Firma CONDOR - vařič "dřívkáč"
This cooker is designed for burning small pieces of wood such as sticks, cones and off cuts. It is not permitted to use pit coal and a use of charcoal is possible only on a low output. It is not permitted to use a liquid propellant! Cooker design includes three parts - cooker´s body, a fan and a stable base. Fan is driven by a monocell battery 1,5 V. The running period of the battery is from 6 to 10 hours depending on the type of the battery, its age and requested intensity of the fire. The running period of an alkaline battery, its age and requested intesity of the fire. The running period of an alkaline battery is 2 or 3 times longer. 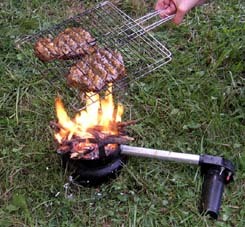 Cooking on the cooker is very cheap and almost independent on the source of fuel. Cooker is uncomplicated and foolproof. The design is massive and it is very stable during even when using a large pot. 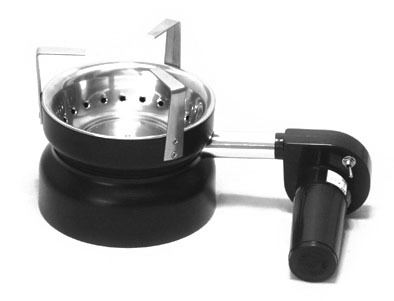 Compared to the common cookers using gas or liquid fuel this cooker does not cause any problems with fuel transportation for example in the aircraft. Servicing is not more difficult than the servicing of a petrol heating (app. 360 grams + 90 grams batteries) but it is amply compensated by saving the weight of the fuel. We stand the cooker´s body on the stable base and attach the fan from the side. We use kindling and firewood for setting the fire. After initiating the flame we turn on the fan to full power output for a very short time. The intensity of the fire can be controlled by the alteration switch on the body of the fan. During the cooking it is sometimes necessary to put the pot off the fire and refill the firewood. Intervals between feeding the fire depend on the kind of the firewood, the size of the sticks and the intensity of the flame. One litre of water begins to boil in app 5 to 10 minutes with 1 to 3 feedings of the fire. Total fuel consumption is very low and the firewood can be found almost everywhere. Wet firewood can also be used for feeding the fire. The power of the cooker is than lower. Wind can deflect the flame and thereby decrease the fire´s power. Therefore it is useful to put the cooker leeward. In case the cooker is used at a themperature below the freeze point it is necessary to transfer batteries in your pocket to keep them warm and hold the whole batteries´ capacity. A pot with 10 to 30 cm in diameter and a content up to 5 litres can be used. Low pots are better in utilization of the energy of the enrgy of the fire and aluminium pots are better than the steel ones. Cooker can be packed into pots with inside diameter of 15,5cm and height of 9 cm, which is for example the size of the Czech army pots. It is necessary to follow all the safety rules of making and keeping an open fire during the cooker´s operation. Cooker may be used only outdoors and on a flame resistant underlayment such as sand, stone etc. It is necessary to keep adequate distance from any fiammable object. Children are not allowed to use the cooker without direct guidance of an adult.